We will start with some tasty snacks and a brief introduction to Cycle Toronto and the Toronto Centre for Active Transportation, who will share research on the challenges of suburban cycling. From there we will hear a summary of some of the big ideas suggested at last year’s summit, after which you’ll have a chance to vote for your favourite projects. Toronto Votes 2018: Help us raise cycling as an election issue in your community. This event is part of a series that is intended to make it easier for new volunteers to get involved in shaping the growth of cycling culture in neighbourhoods all across our city. 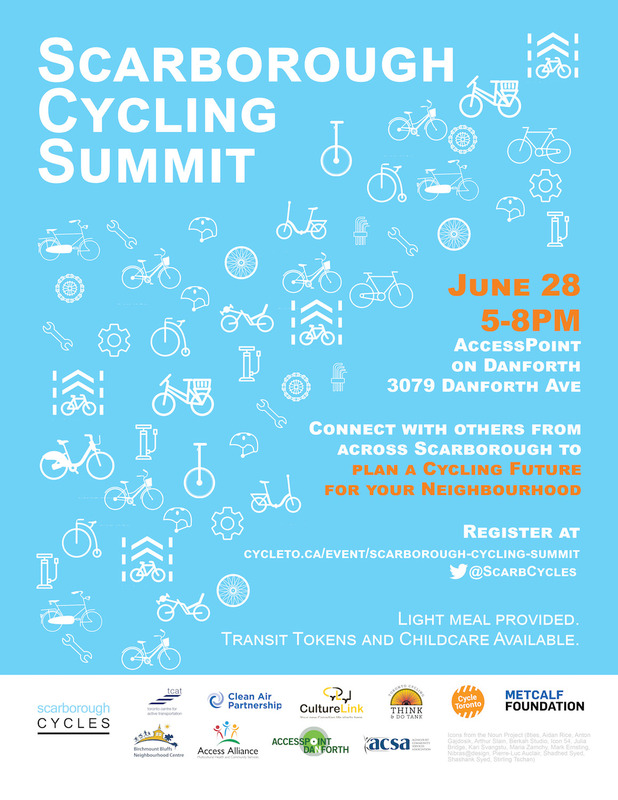 It is a chance to connect and coordinate with others who are engaged in cycling programming, or otherwise working to improve cycling in Scarborough. Childcare will be provided in the same building, free of charge. Transit riders: If you’re taking the TTC, show us your transfer and we will reimburse you with tokens. This special summit is part of the Scarborough Cycles project. It is co-presented by Cycle Toronto and the Toronto Centre for Active Transportation.